Roster last updated on April 23, 2019. 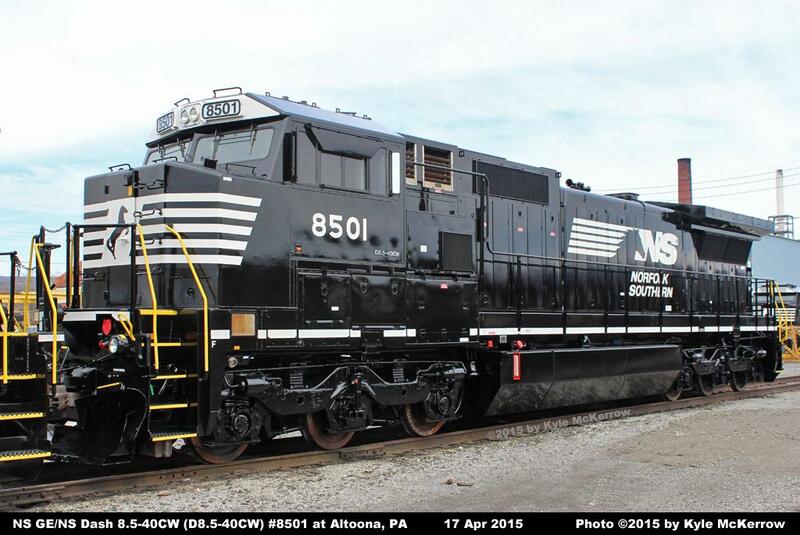 8500 NS GE Dash 8-40C 8305/CR 6032 03-1989 1877 45913 06-2015 NS Unit currently stored, but still on the active roster. 8501 NS GE Dash 8-40C 8309/CR 6043 03-1989 1877 45924 06-2015 NS Unit currently stored, but still on the active roster. 8502 NS GE Dash 8-40C 8311/CR 6046 03-1989 1877 45927 02-2016 NS Unit currently stored, but still on the active roster. 8504 NS GE Dash 8-40C 8307/CR 6035 03-1989 1877 45916 06-2015 NS Unit currently stored, but still on the active roster. 8506 NS GE Dash 8-40C 8310/CR 6045 03-1989 1877 45926 10-2015 NS Unit currently stored, but still on the active roster. 8507 NS GE Dash 8-40C 8690 12-1990 338-26912 46384 03-2016 NS Unit currently stored, but still on the active roster. 8508 NS GE Dash 8-40C 8692 12-1990 338-26912 46386 03-2016 NS Unit currently stored, but still on the active roster. 8509 NS GE Dash 8-40C 8737 09-1992 338-26924 47099 03-2016 NS Unit currently stored, but still on the active roster. 8510 NS GE Dash 8-40C 8708 12-1990 338-26912 46402 07-2016 NS Unit currently stored, but still on the active roster. 8511 NS GE Dash 8-40C 8712 03-1991 338-26916 46633 10-2016 NS Unit currently stored with collision damage. 8512 NS GE Dash 8-40C 8699 12-1990 338-26912 46393 09-2017 NS Unit currently stored, but still on the active roster. 8513 NS GE Dash 8-40C 8761 12-1992 338-26924 47123 06-2018 NS Unit currently stored, but still on the active roster. 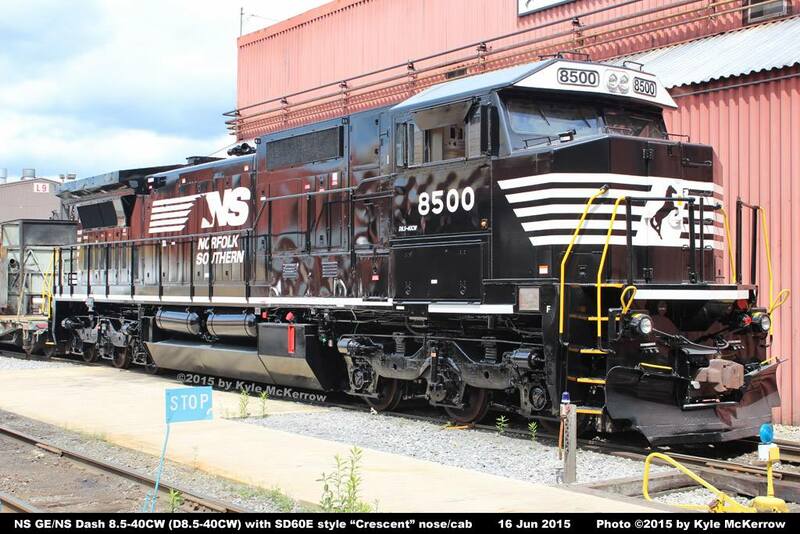 (8503) NS GE Dash 8-40C 8312/CR 6047 03-1989 1877 45928 -- NS Unit undergoing rebuilding at Roanoke, new RLS cab/widenose installed. Powered by a GE 16-cylinder 7FDL16 engine. Equipped with the Traction and Engine Control Unit (TECU) from TMV Control Systems. Equipped with NS-designed split cooling system. Unit is upgraded to meet Tier 2 emissions standards. Upgraded from GE752-AG to GE752-AH traction motors. Equipped with cab air conditioning. Equipped with NS LEADER/PTC (Positive Train Control) system. long hood end pilot for HEP/stand-by power use. Unit 8500 is equipped with a replacement NS-designed "Crescent" (SD60E style) wide nose and cab. Units 8501-8502, 8504, and 8506-8513 are equipped with a replacement NS-designed "RLS" wide nose and cab.